Leftover picadillo and brown rice makes a super easy second meal, all in the crock pot. 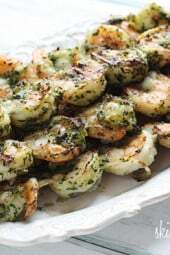 Top it with melted cheddar or Monterey Jack cheese and you’ll have a delicious dinner without much fuss. These picadillo stuffed peppers are a complete meal-in-one. As I mentioned in my last post, we use leftover picadillo many ways in my home. Stuffed peppers are a great way to use leftovers and nothing goes to waste here – the tops of the peppers get diced and are added to the filling. The slow cooker is the perfect appliance for making stuffed peppers, I’ve also included oven directions below. When buying bell peppers for the slow cooker, I look for peppers that have flat bottoms that can stand upright on their own. You can double the recipe to make 6, which would fit perfectly in a 6 qt slow cooker. And since so many are asking, I have the 6 Quart Hamilton Beach Set ‘n Forget Programmable Slow Cooker. I love it because you can adjust the time you want it to cook, and it automatically turns to warm when it’s done. It also has a probe for meat that automatically shuts off when done. I hated my old crock pot, it burnt everything and my food had a weird taste. This crock pot is so great, I actually own two! and there’s even a stuffed pepper soup. Enjoy! Cut 1/2 inch of the tops of the bell peppers and dice fine. 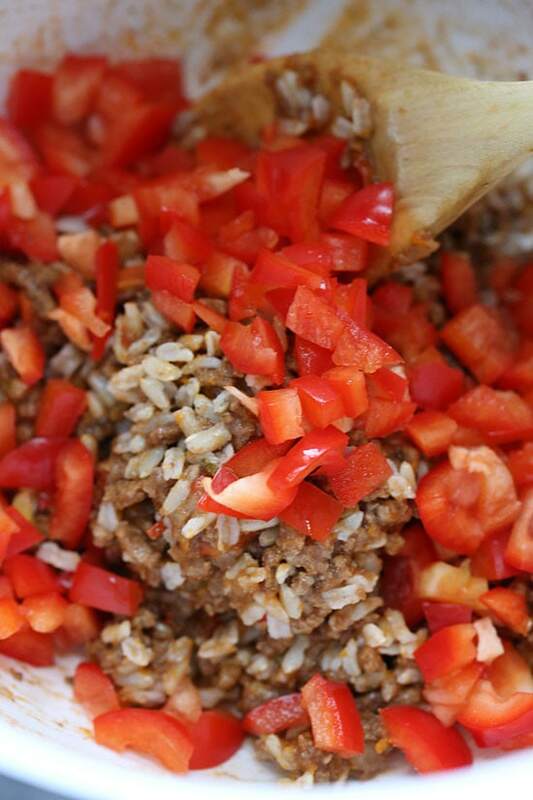 In a medium bowl combine cooked brown rice, picadillo and diced pepper tops. Stuff the peppers with the picadillo and rice filling and place upright in the crock pot. Pour the water into the bottom of the crock pot, cover and and cook 3 hours on HIGH -or- 4 to 6 hours on LOW. 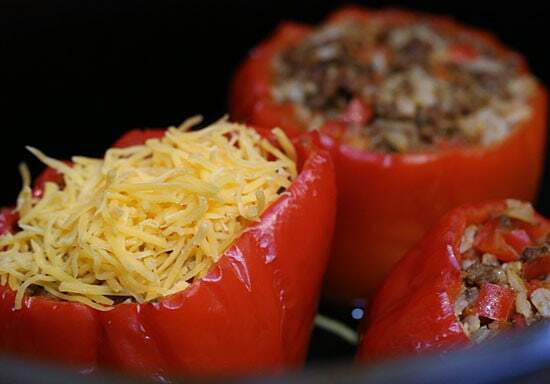 Just before serving, top each pepper with 2 tbsp shredded cheese, cover and leave until it melts, 2-3 minutes. Oven directions: Preheat oven to 350°. Place peppers in an oven-proof dish, pour about 1/3 cup water in the bottom of the dish, cover and bake 50 minutes, or until the peppers become soft. Remove foil, top each cheese and bake uncovered 5 minutes. We are low carb. Would Cauliflower Rice be the only alternative here? My husband HAAAATES the taste of cauliflower and I’d hate to ruin this delish recipe if he could taste it mixed in. PS – LOVE the Picadillo recipe … So great fresh and as leftovers! Would this be around 4-5 freestyle points with cauliflower rice? Why are the values for cholesterol sometimes left blank? Since I am very carefully watching my cholesterol I need to know what they are. Also I noted that in this recipe the value for sodium is also left out. I never use salt in my cooking and need to know how much sodium there is in any given recipe. I am sure there are many other readers of your blog who need this information as well. Older recipes I didn’t include so those are missing. Love to know the smart points as well! Can you tell me what the smart points will be per pepper. Question, this was listed under the vegetarian recipes, its got beef in it, how is that vegetarian? Making the picadillo now. Stuffed peppers tomorrow. Will also put black beans and quinoa instead of rice. Will let you know how my picky husband likes it. Curious how much the pt value changes if you use 90% lean beef? What do u think? Can't wait to try this recipe! This was really yummy. My husband loved it too! The peppers were a little soggy, is this normal? Yes, they should be soft. My husband and I make your recipes every week, many times multiple times a week. You've given us some great staples and this just became one! As always, this recipe has me drooling. Can't wait to try it out. You're such an inspiration! Hi Gina! I made these yesterday with the leftovers from the picadillo! GREAT use for them. They looked so pretty and made the house smell WONDERFUL. I think if I did it again though, I need to adjust the slow cooker time. I actually did 6 hours at low so they'd be ready when I got home from work but that was a bit too long as the peppers fell apart once I tried to take them out of the crockpot. 🙁 Do you have any tips on how to keep them falling apart? Or do you have any thoughts that cooking on "high" works better for this recipe? This is definitely something I would make again but next time I'll try 3-4 hours on low. Or I'd just make sure I can keep an eye on it. Could you stuff the peppers ahead of time and keep them in the fridge? Those look so good and I love that you can put them in the crockpot and not have to worry about them. These will definitely be made this weekend! How is this 10 points? Am I missing something? Also, will one pepper fill you up? Or do you think you need a side item to eat along with this for dinner? It's the way the WW recipe builder calculated it. It takes the peppers's nutritional value into account for the recipe and calculates the points from that. Could you also stuff cabbage with this? I just wanted to say that I did make this over the weekend. Everybody is always quick to state that they will make it and it sounds yummy but they usually never reply back. This was my first time ever making both dishes and they both turned out great. I stuffed yellow peppers and cooked them in the oven but put sauce around it instead of water and my husband loved it. This is something that I will make again. My daughters don't especially like peppers so I stuff zucchini instead. Delicious!! Am going to try this filling and I bet it will be amazing! Thanks Gina!! Hi- I absolutely LOVE all your recipes. My boyfriend eats pretty healthy and loves peppers so I wanted to try and make one of your recipes. He eats any kind of ground meat, which is your FAVORITE of all your stuffed peppers recipes that I should try for tonight?? 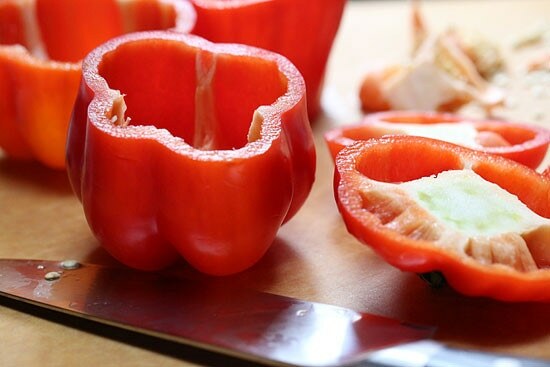 Can't eat peppers – would this work for stuffed tomatoes? Would the times need to vary? Hi, Vivian! "Pastelon de plantano" is a ripe plantain casserole that is made with a ground beef mixture that is very similar, if not the same as the Picadillo mixture. I think that its origin is from the Dominican Republic. Can this picadillo recipe be used to make pastelon? If so, is there a way to make "Skinny Pastelon?" OMG! It would be awesome if there was a "skinny" version of that. I just discovered your website and I am soooo happy! This is now my favorite online cookbook. I'm on Weight Watchers and I love beautiful pictures of food! I want to make a ton of recipes right now! OMG! I started salivating at the first glance of that picture. I absolutely love stuffed peppers. I made the stovetop version of your picadillo the other day for my sweetie and my low-carb loving sister. Everyone raved about how good it is, so kudos for a great recipe. I wish I had the insight to use it for stuffed peppers because I ended up just eating the meat on a tortilla. But I'm definitely going to try this. Now you have my creativity going on what other ways I can use the picadillo for a mouthwatering meal. So glad you all enjoyed it! I love making a second meal out of it! These look great, but I don't think I'll ever be able to make them! I made the picadillo last night for 5 people. There were no leftovers because it was SO GOOD! My teenage girls LOVED it! Thank you! LOL, double it next time! Love it!!! Great use for leftovers! I want to make these soon. Do you think they will freeze well uncooked for planning ahead? Good question, I know the filling would freeze ok, not sure about the pepper but I don't see why it wouldn't. If you subed quinoa for rice would that change the points? Not sure off the top of my head, my guess is they would be the same. Im sure it would be great and extra protein. 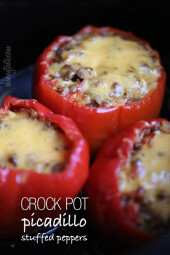 I love using my crock pot to make stuffed peppers too! So easy! 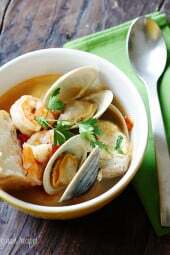 This would be a wonderful meal to make for a friend in need. Love your recipes! 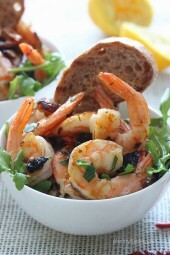 This look delicious and a great way to use leftovers! I have never made stuffed peppers before, but it definitely happening this weekend! Love that you posted a crock pot and oven version! Yay! I feel like this is probably a stupid question, but would it be okay to make the picadillo fresh for this recipe – any easy time adjustments I could make to the crockpot or anything? Absolutely, you can use the stove top version if you want to make it all in one day. I love that this recipe uses leftovers! My husband doesn't always love leftovers so this is a great way to "disguise" them. 🙂 We love your crock pot pork adobo but often have lots leftover (if we're watching our portions) ;). Do you have any suggestions for those leftovers? Thank you, Gina. Your website is amazing!! My husband doesn't either, so it's great to re-purpose leftovers and for stuffed peppers! I would have never thought of this! 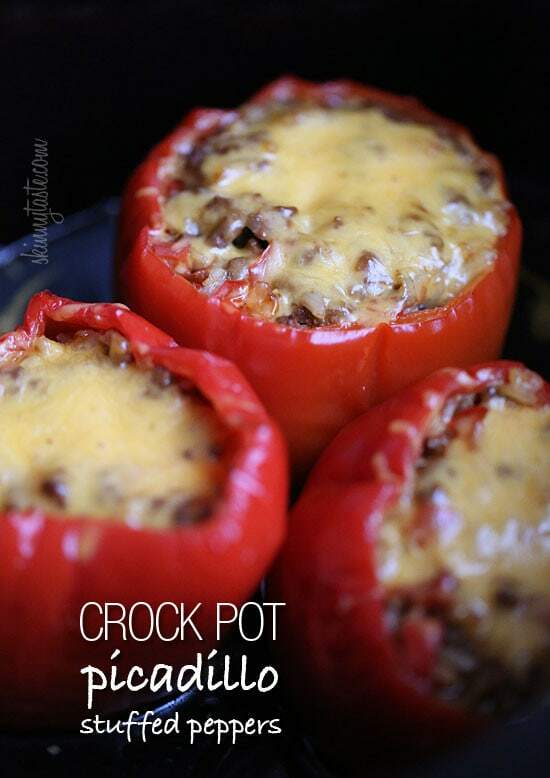 Sounds so good, and I love the idea of using the crockpot to make stuffed peppers. Such a fun way to use the leftovers! 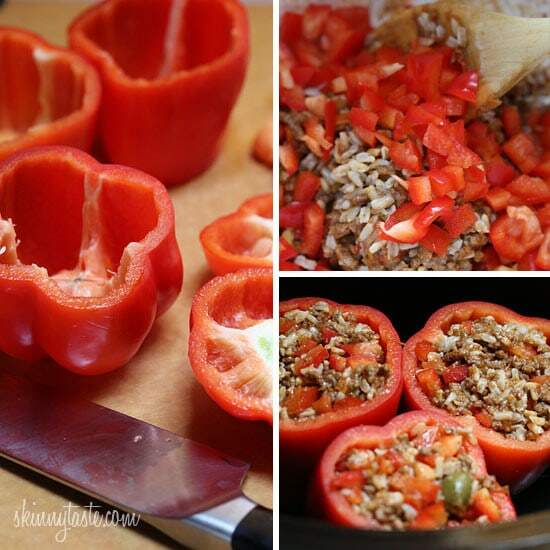 My husband loves stuffed peppers – these sounds great! What a great way to use up the leftovers!